Adding close to 30HP to your RAM truck will provide you with a tremendous driving experience. With added power comes the opportunity to pick up fuel efficiency, tow with improved low-end response, and eliminate downshifting. 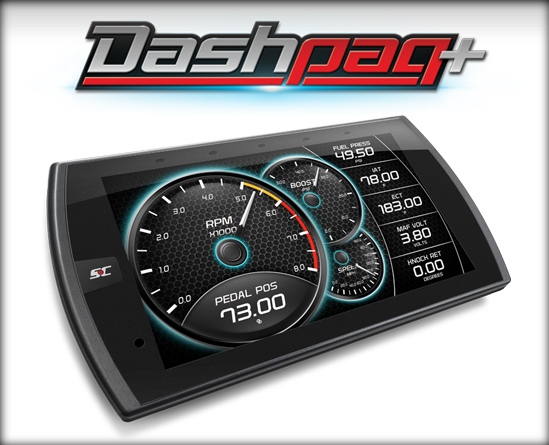 On top of gains in horsepower and torque, Dashpaq+ gives you the options to customize your on-dash display to broadcast the most important information for your specific driving purpose. Whether it be transmission temperature, inlet air temperature, MPGs, or even throttle position, the Dashpaq+ will allow you to customize your look. Add power off the line and as your pull through each gear. 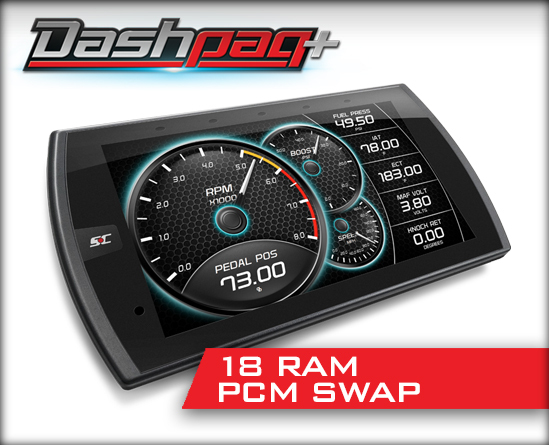 Manage fuel efficiency, recognize, read and clear trouble codes prior to a trip to the dealer, and enjoy instant power paired with style with Dashpaq+ for your RAM truck today. Dodge Chargers, Challengers, and 300C cars are a boatload of fun to accessorize. The team at Superchips is well aware that these vehicles are often modified and Dashpaq+ offers a turnkey product for those looking to add instant power. Many customers use these cars as daily drivers, but enjoy the opportunity to hit the track and push their vehicle to the limit. The Dashpaq+ for Dodge/RAM gas cars is loaded with some sophisticated monitoring options to bundle with our pre-loaded tuning. New features include our performance tests and track ticket. You can now measure your calculated horsepower and torque, 0-60 MPH time, ¼ mile time, and more directly from the on-dash, capacitive touch screen. Log your tests and then save it to your device to download and upload to your PC. Post your results to your Facebook or Instagram page to show your friends! Looking to take things a step further with more sophisticated mods like a supercharger, headers. etc. Dashpaq+ includes the option to load and store custom tunes from an authorized 3rd party dealer. Learn more on our custom tuning page today!